Does your LinkedIn profile look like a CV? If your answer is yes, then it’s high time for you to spice up your profile with some personal branding tips from the experts. As the social media guy at Strategy Solutions (an executive search firm based in Sydney), I make sure that our employees’ profiles are optimized for conversion. These profiles make up our first impression with clients or candidates, so I wanted to make sure that they best represent the company. When my team started the project, we found out that most of our employee profiles look like the usual CV?—?they are not optimized for conversion! But when we started to implement personal branding strategies in May, our overall employee profile views soared 2.73x by the end of June. We were getting almost thrice the traffic by just doing some little tweaks on our profiles. Now how exactly did we do it? I want to share with you my personal hall of fame in the field of marketing and offer some tips from these thought leaders. I keep different halls of fame in different areas of my life. 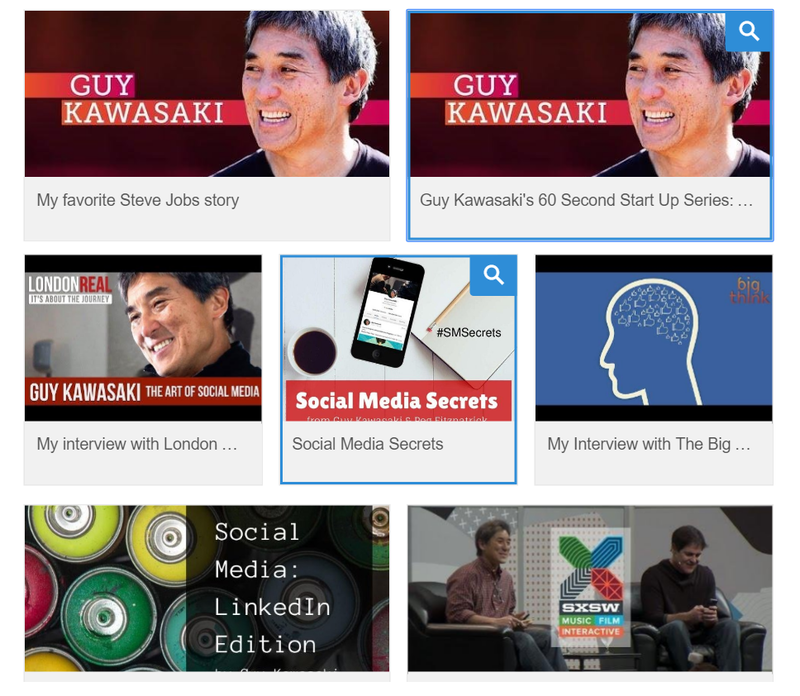 But these gurus truly rocked their LinkedIn profiles. It’s great to see them practice what they preach. Colored visuals increase people’s willingness to read content by 80%. 65% of marketing executives agree that visual assets (e.g. photos, videos, illustrations, etc.) are the core of brand communication. Our brain loves good storytelling. It’s the thing called oxytocin in our brains which enhances our feelings of empathy?—?to experience other’s emotions. If you feel motivated or persuaded, then it is the oxytocin system working in your brain. If you want to go deeper about how this works, check out this article from HBR. A great example profile I found is William Arruda, a branding expert who works with the big names in the industry: JPMorgan, Microsoft, American Express, etc. 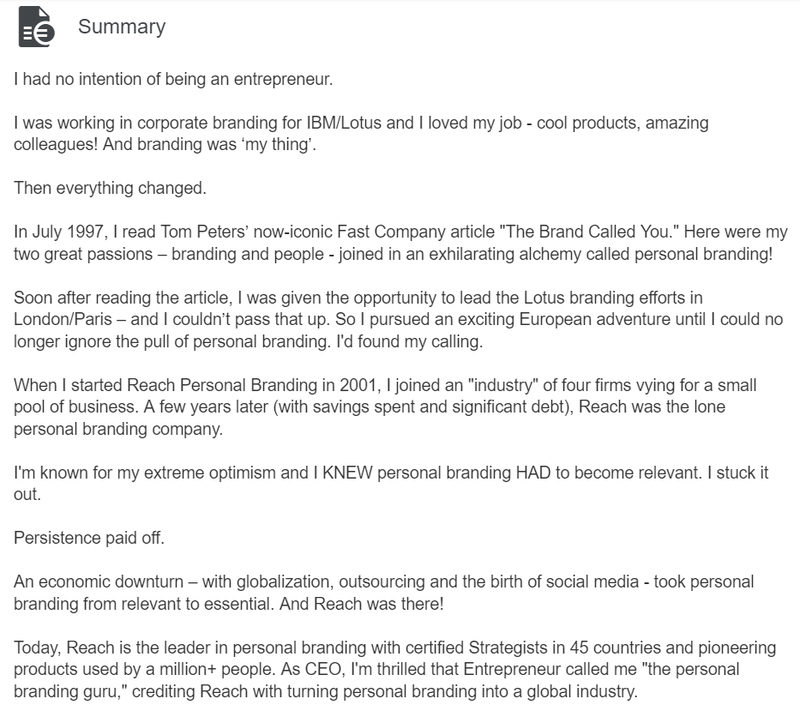 See how he tells his brand story in his profile. There are so many ways you can craft your background photo/banner: put eye-catching graphics, direct your audience to a URL, fill it with CTAs, add some of your taglines, add quotes, etc. Martin Lindstrom is known as the Sherlock Holmes of branding and is frequently consulted by Fortune 100 brands like Coca-Cola, Nestle, Red Bull, etc. He looks for those small clues which have become so commonplace to us?—?the way we store our toothbrush, the contents of our fridge, the displays in our living rooms?—?to get the idea to launch a brand’s next marketing campaign. Check out the simple but branded background/banner on his profile below. Have you tried putting a link in your Summary? It’s not clickable right? If you put a URL on your Summary, it just appears as ordinary text. But you can actually do away with this and put a clickable link on your profile by adding it as a Project and then provide a Project URL. 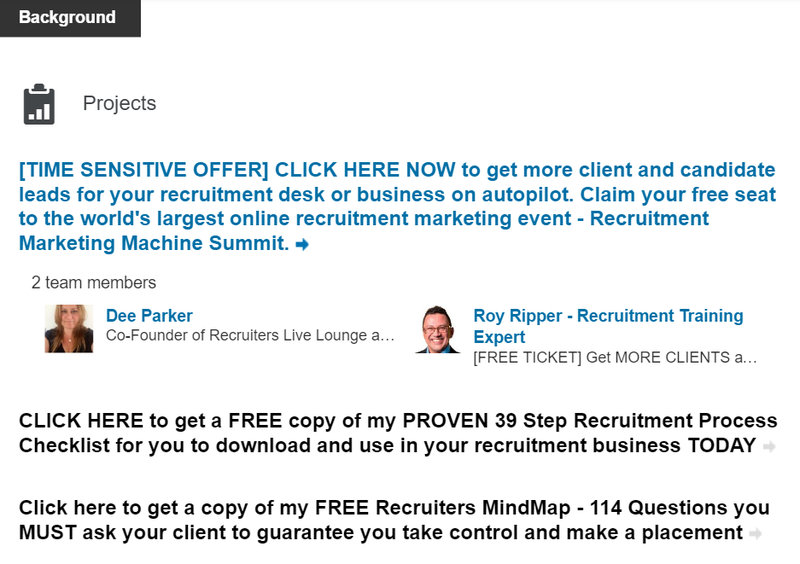 If you’re in the recruitment industry, you have probably heard of Roy Ripper. He has branded himself as a Recruitment Training Expert. His profile is so beefed up with CTAs that he has literally turned it into a lead generation channel. Your profile headline or tag line is the first description that people will see especially in search engines. It’s a good place to enrich your profile with keywords that are SEO-friendly. Start with words or phrases that you want people to use in order to identify you. You can change this from time to time depending on your situation. It's interesting to see how many profiles have "Chief Troublemaker" as their profile headline. Jane Anderson brands herself as the Presence Expert. Her profile is in the top 1% most-viewed LinkedIn profiles globally. Check out how she uses the 120- character profile headline. There’s a whole lot more that you can do with your profile. Feel free to add some comments and share some of your personal branding tips. Ken Mendiola is the social media guy at Strategy Solutions Ltd. (executive search and recruitment firm). He manages the company’s LinkedIn talent brand which has a reach of more than 84,000 members. He writes about branding, marketing strategy, social media marketing, and recruitment marketing.